Long silence. This was shortly after their sterling album “The Notorious Byrd Brothers” had been released, and guitarist-singer-songwriter-troublemaker David Crosby had been fired from the group. College reporter: (Trying helpfully to jar their memories, suggesting songs from the new album) How about ‘Tribal Gathering’? M: (dirty look) That’s a Crosby song. College reporter: (undaunted) How about ‘Dolphin’s Smile’? H: (dirty look) That’s a Crosby song. CR: (yet undaunted) How about ‘Renaissance Fair’? M&H: (in unison) That’s a Crosby song! CR got daunted, M&H got hazier and mazier, and though they tried to be cooperative and communicative, the interview was less than memorable or revealing. 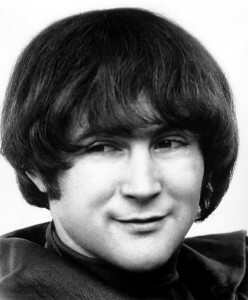 I’m not saying that David Crosby was The Auteur of The 1966-68 Byrds. They really were a band in the fullest sense of the term. It’s strange how strong personalities can sometimes meld and subjugate themselves to a group voice. Think of The Beatles circa “Rubber Soul”, songs like ‘Wait’, ‘And Your Bird Can Sing’, ‘You’re Going to Lose That Girl’. Even if you can piece out whether it was Paul or John who wrote it, they’re all still much more Lennon/McCartney than Lennon or McCartney. 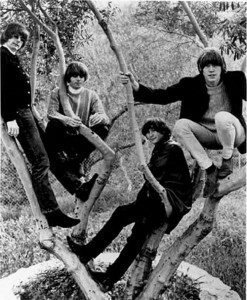 Most of The Byrds finest songs from their golden era were of that ilk – the trademark McGuinn guitar and vocal; the Crosby harmonies; the stunning Hillman bass-lines; the cool, stoned hipster attitude; the jingle-jangle sound. Group efforts. Don’t forget, it was The Byrds who squeezed Dylan into a band context. It is true, they also did give him the bug. When he heard their groundbreaking version of ‘Mr Tambourine Man’, the song that “effectively created the template for the musical subgenre of folk rock”, Dylan said, “Wow, man! You can dance to that!” Apparently his tongue was not in his cheek, because he actually joined them on stage – the first time he mingled with mortals of the electric persuasion. Like Dylan, most of The Byrds came from a folk background. 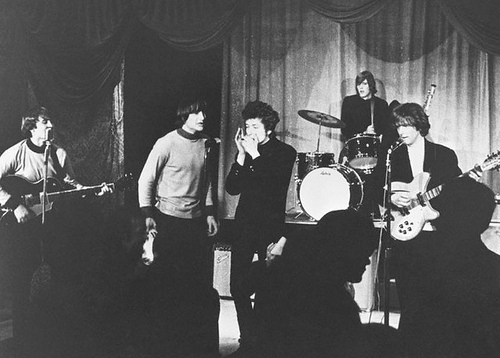 But when they went electric, they bent their strong individual voices to the band’s sound. That was part of the process, part of the energy and strength of Beatles-inspired groups. It was only in “Revolver” (August, 1966) that John and Paul fully began to give flight to their individuality, a gift from Mr Dylan. And it took a while for that to filter down to the rest of the world. The Byrds, in the three albums that constitute the apex of their flight (“Fifth Dimension”, “Younger Than Yesterday”, “The Notorious Byrd Brothers”) display a mix of group and personal aesthetics, even in side-by-side tracks. Hillman, a great bassist and excellent lead and harmony singer, was less of an individualist. But by himself he wrote four songs that constitute the meat of their finest album, “Younger Than Yesterday” (‘Time Between’, ‘Have You Seen Her Face’, ‘Thoughts and Words’ and ‘The Girl With No Name’), each one brilliant, all four contributing greatly to the incursion of country music into rock. 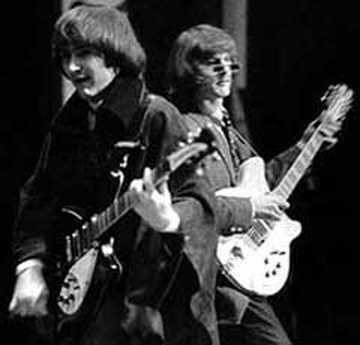 Surprisingly, as I look at the authorship of the songs on “Younger Than Yesterday” and “The Notorious Byrd Brothers”, McGuinn – the acknowledged leader and dominant voice of the group – wrote not a single song by himself, all in collaboration, including most of the group’s most memorable songs: ‘8 Miles High’ and ‘So You Want to Be a Rock and Roll Star’ (with Hillman), ‘I See You’, ‘Renaissance Fair’ and ‘Why’ (with Crosby). ‘Draft Morning’ and ‘Dolphin’s Smile’ (the three of them together); ‘Tribal Gathering’ was Crosby and Hillman. I’d like to zoom in this week on what may seem an obscure corner to most people, but to those of us who lived and breathed the music of The Byrds in those years, it’s the corner where much gold is buried – David Crosby’s solo efforts in the group. There aren’t too many. He was an agent provocateur, disliked by McGuinn from the beginning. 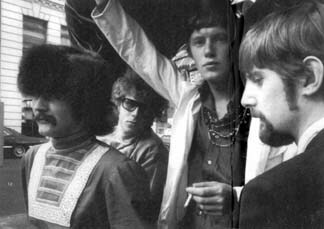 Here’s their famous appearance from 1967 at the Monterey Festival, the West Coast forerunner of Woodstock. Watch Crosby rant about Kennedy assassination conspiracies while his bandmates fume. 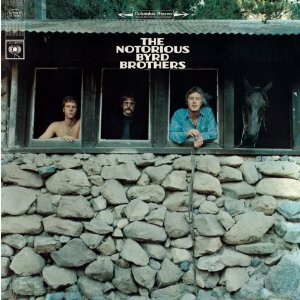 Here’s the album cover of “Notorious”, showing Hillman, McGuinn and drummer Clark, and in the rightmost window the band’s substitute for the recently departed Crosby. One of Crosby’s main solo efforts, the very fine ‘Lady Friend’, was left off the album just out of spite. Another, ‘Triad’, was the straw that broke the horse’s back and triggered his pink slip. It’s a lovely paean to a ménage à trois. Here’s The Byrd’s ragged version of the song, here’s Crosby’s solo treatment from 1969 with CS&N, and here’s the definitive version as sung by Grace Slick for Jefferson Airplane. What other solo efforts did Crosby contribute to The Byrds? The very fine, early psychedelic ‘What’s Happening?!?!’. The clunker ‘Mind Gardens’, so bad it makes ‘Almost Cut My Hair’ sound like ‘Eleanor Rigby’, and our Song of The Week, ‘Everybody’s Been Burned’. Crosby never wrote strong melody lines or finely crafted songs. His best work for his next band, Crosby Stills & Nash (‘Déjà Vu’ and especially ‘Guinevere’) are products of a psychedelic sensibility – floating, meandering, precious, delicate, shimmering, as unfettered and fragile as a soap bubble wafting in a marijuana cloud above a Tribal Gathering. ‘Everybody’s Been Burned’ is more than a precursor of those gravity-defying gems. It has the weight of melody and lyric content and meaning and emotion and passion, and yet it still floats. Listen to Hillman’s stunning bass, to McGuinn’s unique 12-string lead and to Crosby’s ephemeral rhythm guitars, to Crosby’s perfect vocal. I’m not done with this subject. I’ve glossed over both The Byrd’s great music and Crosby’s great harmony singing. But this week let’s just give our attention to this beautiful, memorable ballad, as fine as head music can be. Thanks, David. The Grateful Dead, ‘Box of Rain’. 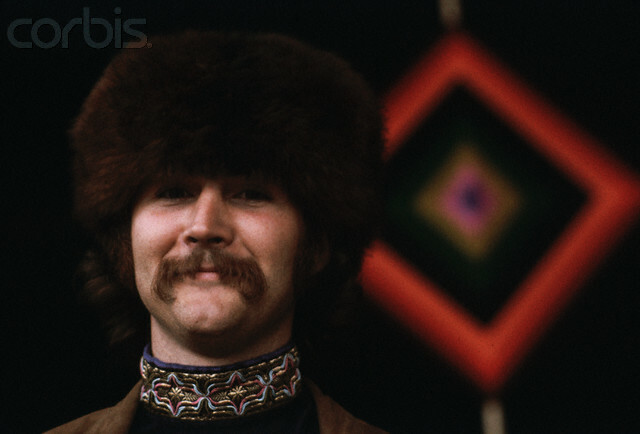 Marginally-stable, fairly talented guy + mountains of drugs = David Crosby. Still, a surprisingly decent musical legacy. If you play “Everybody’s Been Burned” and “Mind Gardens” at the same time (just open two windows on your browser, navigate to one song in each and let her rip), it’s just like being high back in the 60’s. PS – Only works if you are over 57 years old. Sorry younguns. This is definitely one of my all-time favorite Byrds songs!! !